The small crossover had unholy amounts of road noise penetrating its cabin, and I wanted to see if the company’s radical emphasis on human-centered design had made Mazda’s smallest four-door cars more comfortable to drive. Comfort, though, is only part of the picture. 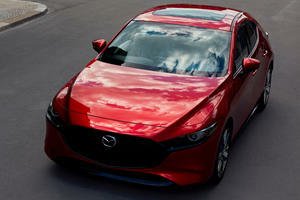 Visually, the fourth generation of Mazda3 takes an evolutionary step ahead by deepening the brand’s commitment to the . 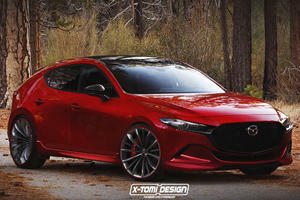 To do so, Mazda gave the sedan and hatchback a defragmented mesh grille and thinner LED headlights before bringing out the chisel. Tool in hand, it went about thinning round body panels and sharpening accent lines on the hood and rear end. Then it did the opposite with the beltline, softening the transition between the car’s visual heft and the lighter greenhouse. Though the sedan and hatch have plenty in common, Mazda built each to appeal to vastly different audiences. The hatch is the sportiest of the two by far, using black accents, where the sedan uses chrome, and donning C-pillars thicker than a bowl of cold oatmeal to round out the rear and make it look playful. The sedan, on the other hand, aims for the wallets of the responsible by sticking to convention. Its lines are sleek and exude strength and beauty, but the side and rear profile left me wishing Mazda had done more to differentiate it from the 3rd generation. While the exterior of a modern Mazda is the type to make a driver look back a few times on the hike from driveway to front door, the Mazda3’s insides are an equally appealing example of the automaker’s push to become a premium brand. A rich texture of upscale materials including leather, metal, and buttons designed with just the right amount of resistance to each press are placed with a meticulous emphasis on ergonomics. Mazda takes placement seriously, it even blindfolds its test drivers and redesigns the cabin until each button is in a place that feels most natural. And because the KODO philosophy dictates that simplicity, beauty, and ease of use should reign supreme in every Mazda, interior decorators have gone about segregating the cabin. Controls and information most pertinent to driving are right in front of the driver, leaving the navigation, connectivity, and media information to the standard 8.8-inch widescreen display to the right of the driver. The beauty in Mazda sweating the details is that you never once think about these things while driving. Instead, the seamlessness of the experience - whether interacting with Apple CarPlay/Android Auto using the rotating knob in front of the armrest or adjusting cruise control settings on a steering wheel that could be the segment’s benchmark for beauty and ergonomic design - opens up space in a driver’s mental bandwidth to make the drive more relaxing. It’s done so subtly and artfully that the Mazda3’s interior frequently feels like it’s from a car costing twice as much. I wish, though, that I could reserve the same enthusiasm for the engine. After arriving in Squaw Valley, Mazda sent me driving to Sacramento in an i-Activ all-wheel drive Mazda3 sedan before I switched into an AWD hatchback at the halfway mark. The drive route aimed me down winding Sierra Nevada roads where it became painfully clear the 186 horsepower and 186 lb-ft of torque produced by the 2.5-liter four-cylinder SkyActiv-G engine was not enough. Though the Mazda3 outranks much of its competition in terms of output, pinning the throttle to the firewall would force the engine to yell itself hoarse while the Mazda3 gained speed as if its tires were coated in a layer of molasses. The sound of the engine simply felt out of line with the acceleration the car was producing. Even with the six-speed automatic transmission holding gears longer in Sport mode (the six-speed manual can only be had with a front-wheel drive hatch), the Mazda3 doesn’t feel capable of turning out a 0-60 mph run in less than 7 seconds. Fuel economy helps make up for the woes, with the AWD sedan attaining 25 mpg in the city, 33 on the highway, and 28 mpg combined. The hatchback loses only 1 mpg in each of those categories, but with FWD both the sedan and hatch can make 26 mpg in the city, 35 on the highway, and 30 mpg combined. While the hatchback is technically the Mazda3 you want for maximum carrying capacity, it feels smaller inside than the sedan. Blame that on the massive C-pillars, which make for a very large blindspot and allow less light into the cabin than the sedan. While the hatchback’s cargo area feels smaller for the same reason, the absence of a decklid brings total carrying capacity to 20.1 cubic feet rather than the sedan’s 13.2 cubic feet of trunk space. The two cars share the same 70.7-inch width and the sedan is only 0.2 inches taller than the 56.7-inch tall hatch. But the hatchback is shorter, sitting 175.6 inches long vs. the 183.5-inch long sedan despite the fact both share a 107.3-inch wheelbase. Legroom stays the same across the board, with both Mazda3s getting 42.3 inches up front and 35.1 inches at the rear. Headroom, on the other hand, ranges from a maximum of 38 inches up front for non-moonroof equipped sedans and hatchbacks to 36.5 inches for a moonroof-packed hatchback’s rear seat. Before making my way to Sacramento, Mazda had me do a slalom through a snow course it had built outside the hotel so I could get a taste of what it calls "G-Vectoring Control.” In its first iteration, the system would reduce the engine’s torque output when the wheel was turned so weight shifted from the rear wheels to the front tires, but the Mazda3’s newer GVC Plus system also brakes the outside front wheel at the conclusion of the turn to help straighten the steering wheel. The system works imperceptibly on the road, but on the slippery snow track it helped the Mazda3 grip earlier and steer more quickly when making sudden maneuvers. With GVC Plus adding a boost of confidence, I had no qualms about letting the Mazda3 pick up speed as it wound down snow dusted Sierra Nevada roads and headed to the flatlands of California’s capital city. With gravity giving the Mazda3 a boost on the twisty pavement, two things became apparent. One, that the steering is fantastic and two, that the suspension is too. Road noise was still an issue over the frequently-plowed Interstate-80, but the Mazda3 soaked up bumps like a professional and kept the car planted as I became more confident and aggressive in the corners. Steering is heavier than in many cars within the segment, but that’s a good thing considering how direct and responsive it feels. When driving on the offensive, it’s obvious the Mazda3 is a car meant to be pushed. Comply with that sentiment and you’ll be surprised by how natural it feels in the corners and how stable it drives on the highway. It’s strange, then, that the capable Mazda3 is not very fun to drive with zest. There’s nothing wrong with it, it’s just, well, it just feels fine. That sentiment applies to both Mazda3s since it's difficult trying to pick out a difference between how the sedan and hatchback drive. The most discernible disparity is the blind spot, which makes city and highway driving in the hatchback interesting. Thankfully, Mazda has made blind spot monitoring standard on the hatchback and embed alerts in the head-up display to ensure a driver can use the tech to lessen the impact of low outward visibility. This time, the Display part of the "HUD” is no longer projected onto a retractable piece of plastic. Now it’s projected onto the windshield and made to look like it's a yard ahead to reduce the time it takes a driver to focus between plastic shard and the road. The remainder of the tech takes a step forward as well, with the faster, smoother, better looking, and easier to use Mazda Connect infotainment system gaining larger buttons, a refined controller knob, and Apple or Android smartphone connectivity. 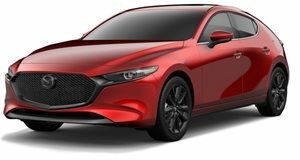 The caveat to Mazda making the Mazda3 more of a premium car than its predecessor is the price, $21,895 for a base FWD sedan including destination. That’s $2,905 more than the previous-gen base model, but that money goes far in making the Mazda3 punch outside of its class. Stepping up to the hatchback will cost you no less than $24,495 including destination, and adding AWD costs $3,000 in the sedan and $1,400 in the hatch when starting with each car’s cheapest FWD option. Those willing to spend more to get features like a premium 12-speaker Bose audio system and heated front seats can opt for the Preferred trim, which starts at $26,095 for a hatch and $25,095 for the sedan, while the Premium model adds $2,300 to each car for a HUD, moonroof, and 18-inch black alloy wheels (for the hatch only) among other upgrades. Hitting the price roof means going with either a $28,795 AWD Premium sedan or a hatchback with the same packaging for $29,795. 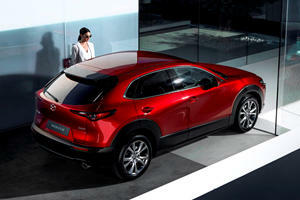 In many ways, the 3 still embodies Mazda’s spunky spirit. It’s a spirit that revels in being the underdog, the fighter who’s back knows the taste of a ring’s ropes. It fights against giants like Toyota and Volkswagen, many times winning in terms of value and quality if not sales, and it does so by paying attention to the details that help connect human to car. The Mazda3 does all these things wonderfully, giving buyers the experience of a car that’s been thoroughly thought out. If I had one serious wish for the Mazda3, it’d be for acceleration that matches the passion felt throughout the rest of the car (or the acceleration of the front-wheel drive Mazda3). If lots of highway miles are in your horizon, it’s something to consider. But if that’s not the case, there’s no reason to miss out on what very well might be the segment’s benchmark. Could the Mazdaspeed3 make a comeback? Shame Mazdaspeed hasn't offered one in years.